I’ve been thinking a lot about that conversation lately, about how every day is a gift, and about what would be symbolic enough to remind us of all the places that God met us in the last two years of Xylon’s cancer treatment. This has led me to think about the biblical idea of Altars, to think on the stories of Abraham, Isaac and Jacob. How there were pivotal moments where they met with God and commemorated it with an altar. Maybe the most striking thing for me as I’ve thought on these stories is how almost always God met these men when they were going through hard things. The Lord met Abraham and Isaac when they were in a crisis. The Lord met Jacob when he was in crisis. The thing that always stuck out for me is that altars were built in the places where God met them to remind them how real and present God is in the midst of trouble. It’s made me realise how easily I forget all the moments in the last three years where God held us, delivered us and changed us. There is so much I want to forget about the last few years but I never want to forget how faithful my God was through it all. We haven’t worked out how we’ll commemorate what God has done. We’re talking about a work of art but perhaps God will lead us to another idea. But I want to find a way to remind myself that God meets me in hard things. 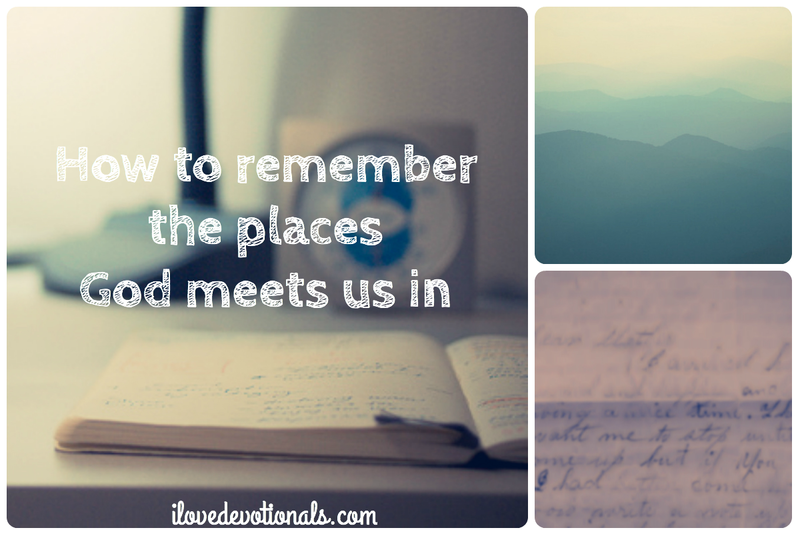 Ponder: What moments has God met you in that are worth remembering? Pray: Lord Jesus, thank you for all the moments that you’ve met me in. This site is a SA blog awards finalist for the best spiritual/religious blog but I need your votes in order to win so please head over to ilovedevotionals.com and click on the red "VOTE" button on the upper right hand corner. You will be directed to the SA Blog Awards website. Your vote for my blog will automatically be entered. You will be sent a confirmation email, which you have to respond to in order to confirm your vote. The process allows you to vote for only one blog per category. Thank you for your support!